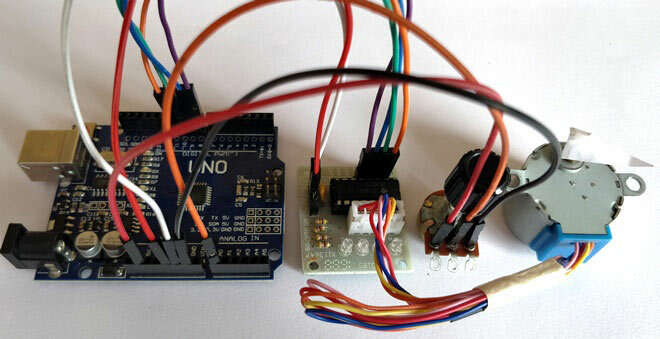 In last project we have simply Interfaced Stepper Motor with Arduino, where you can rotate the stepper motor by entering the rotation angle in Serial Monitor of Arduino. Here in this project, we will Rotate the Stepper Motor using Potentiometer and Arduino, like if you turn the potentiometer clockwise then stepper will rotate clockwise and if you turn potentiometer anticlockwise then it will rotate anticlockwise. The circuit Diagram for the Controlling Stepper Motor using Potentiometer and Arduino is shown above. We have used the 28BYJ-48 Stepper motor and the ULN2003 Driver module. To energise the four coils of the stepper motor we are using the digital pins 8,9,10 and 11. The driver module is powered by the 5V pin of the Arduino Board. A potentiometer is connected to A0 based in whose values we will rotate the Stepper motor. But, power the driver with External Power supply when you are connecting some load to the steppe motor. Since I am just using the motor for demonstration purpose I have used the +5V rail of the Arduino Board. Also remember to connect the Ground of the Arduino with the ground of the Driver module. The Driver module will have four LED using which we can check which coil is being energised at any given time. The complete demonstration video can be found at the end of this tutorial. In this tutorial we are going to program the Arduino in such a way that we can turn the potentiometer connected to pin A0 and control the direction of the Stepper motor. The complete program can be found at the end of the tutorial few important lines are explained below. Now, to make the motor move one step clockwise we can use the following line. To make the motor move one step anti-clockwise we can use the following line. In our program we will read the value of the Analog pin A0 and compare it with previous value (Pval). If it has increased we move 5 steps in clockwise and if it is decreased then we move 5 steps in anti-clockwise. Now, upload the below program in your Arduino UNO and open the serial monitor. As discussed earlier you have to rotate the potentiometer to control the rotation of the Stepper motor. Rotating it in clockwise will turn the stepper motor in clockwise direction and vice versa. Hope you understood the project and enjoyed building it. The complete working of the project is shown in the video below. If you have any doubts post them on the comment section below or on our forums. Hi, I'm new to programming. Wonder if there's a way of rotating the stepper motor at a sharp 90 degrees when the potentiometer is turned. And the motor would return to its initial position when the potentiometer is turned off. I would greatly appreciate your help, thanks in advance!